Homework is the foundation of civilization. Skim the section in the textbook before it is discussed in class. (Read it carefully if you are a visual learner.) Also skim your notes about the previous lecture. This will provide the best mental framework to help your brain process new information, as well as give you a "heads up" for what you might need to ask questions about. Bring the textbook to all classes! Reread the section carefully before you start your homework. Then go back to an example problem, cover its last step, and try to solve that last step yourself. Do this for an example problem of each type. Also, if you have a learning style that needs a lot of repetition, cycle through these key example problems trying more than once to solve the last step or two (or three) of each problem. If possible, do homework with others. Students who participate in study groups almost always pass Math 20. I can help students arrange study groups. When doing homework, build the habit of asking yourself if each answer you get is reasonable. Check your odd answers in the back of the texbook every few problems so you do not practice bad habits. Note: In the Math 20 textbook most homework has only odd answers in the back of the book, but the textbook's chapter reviews, cumulative reviews, and chapter tests all answers to both odd and even problems in the back of the book. After you finish doing the homework for a textbook section try making math flashcards. Put an easy, medium, and hard problem from that textbook section on an index card. Also include any problems from the homework that are especially troublesome. Use these flashcards every week or two: not too often or you will memorize the particular problems. Do the textbook's practice tests and cumulative review tests. When doing practice tests, pretend they are real tests: find a place to work without distractions, do not use notes, and save hard problems for last. When taking the test, if you cannot do a problem skip over it: finish the practice test first and later on investigate how to do the problems that stumped you (and add them to your flashcards). At the first, you can follow what the instructor does on the board and be helped by lecture. At the second, you can do "open book" work and so most of your homework problems are correct. At the third, you can do "closed book" work and succeed on a test without notes and with the pressure of a time limit. It is completely normal to have different levels of math understanding for the different math topics in different chapters. And it is completely normal to not know what level you are at for a topic until you try "open book" and "closed book" problems. So the first step in doing math homework is to determine your Level of Understanding for each new topic. This usually takes about 10 to 20 minutes, and should be done as soon after class as possible. For each topic, start with prompt homework problems. Attempt 2 to 4 problems "open book". If successful, also try some problems "closed book". If you get stuck on any problem, skip it after making a note about which topic is difficult. Try not to spend much time looking at notes or textbook example problems. During this first step your goal is not to finish problems but to find out how much time you will need for studying, and how to pace yourself. The second step is to really do the homework problems. This is not as urgent. Waiting a day or two after the lecture and the "prompt homework problems" can be okay. But it is usually best to structure every day to include some homework time. Really doing the homework problems might take more time than you can afford to dedicate to a single study session. Do all the suggested homework problems, and even more problems if you need extra practice. You need to do enough homework problems to master each topic and reach the third level of understanding. Use lecture notes, the textbook's explanation and example problems, MyLab, and other resources for help. Work forward from the concepts, not backwards from the answer key. To paraphrase, math homework is best considered a two-step process. The two steps have different priorities. The two steps have different urgency. Make a checklist of math topics as the term progresses to keep track of what level you are at for each topic. Please do not worry if a topic is difficult. It is normal to have trouble with some topics for a few of days. A day or two of struggle is not a danger sign. But if a math topic remains difficult after a three days then make sure to get help promptly, so you do not fall behind. Visit office hours, the MRC, or get help from a friend. Homework is what differentiates students who only understand others' work from students who can do the work themselves. What qualities help make writing step-by-step answers helpful to the student and instructor? To add clarity we'll consider a practical example: a PDF file of the Spring 2015 Midterm #1 with handwritten step-by-step answers. (If PDF files do not work for you, you may also click on the images below to see larger versions. You may need to use your web browser's zoom, often by holding down the Ctrl key and tapping the + key). 1. Paper is ruled with lines tall enough for factions. Work is written using pencil in a reasonable size. Some paper has such closely spaced lines that each fraction must be written spread vertically on two lines. This needlessly invites confusion about which lines start a new step. Writing too big wastes paper. Writing too tiny annoys the person grading your work. 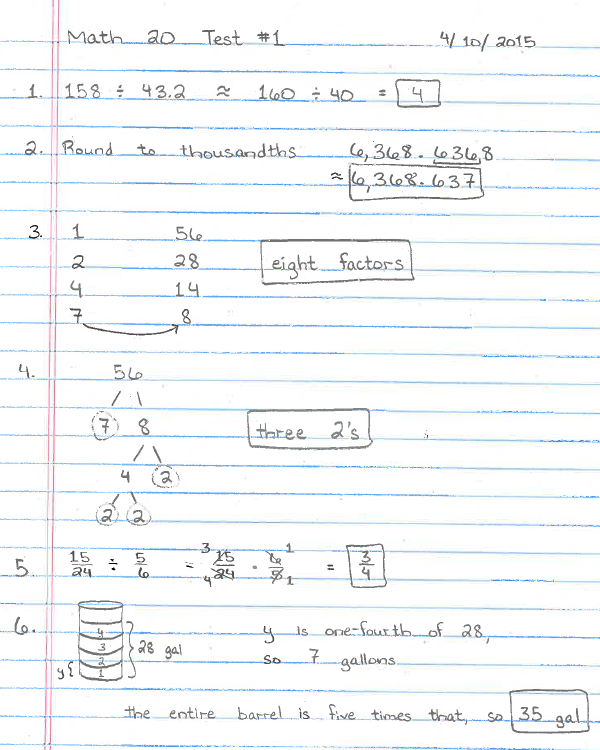 In the sample Midterm step-by-step answers, I used fractions in five of the problems. In all of these problems the fractions are written legibly and take up about as much room as would a whole number. In the sample Midterm step-by-step answers, I switch to writing every other line when the equations are full of fractions. Problem #10 would be less legible if written on only two lines of paper. 2. Fractions are written vertically, not diagonally. Unfortunately, when writing text on a website it often works best to write fractions diaglonally like a⁄b. But this makes fraction canceling and arithmetic less visually intuitive. Since you are writing on paper instead of typing, all of your fractions should be nicely vertical. 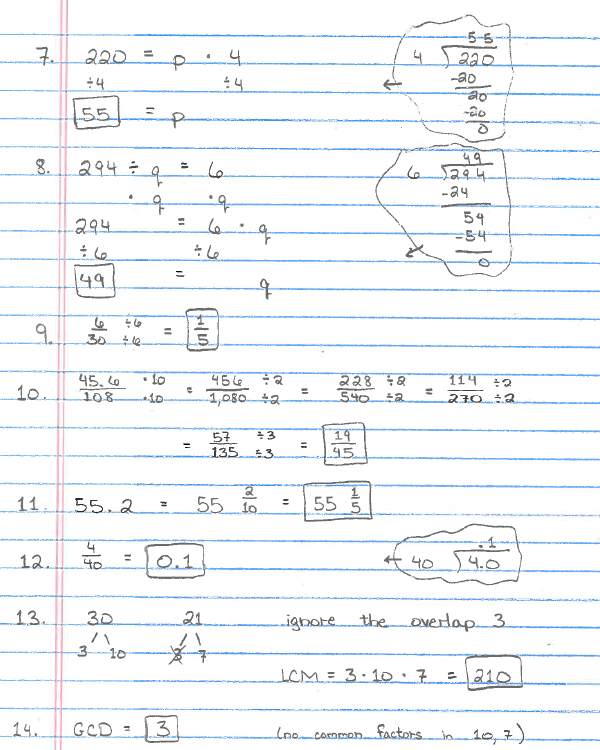 In the sample Midterm step-by-step answers, I always write fractions vertically. 3. Dots for multiplication and decimal points are not confusing. 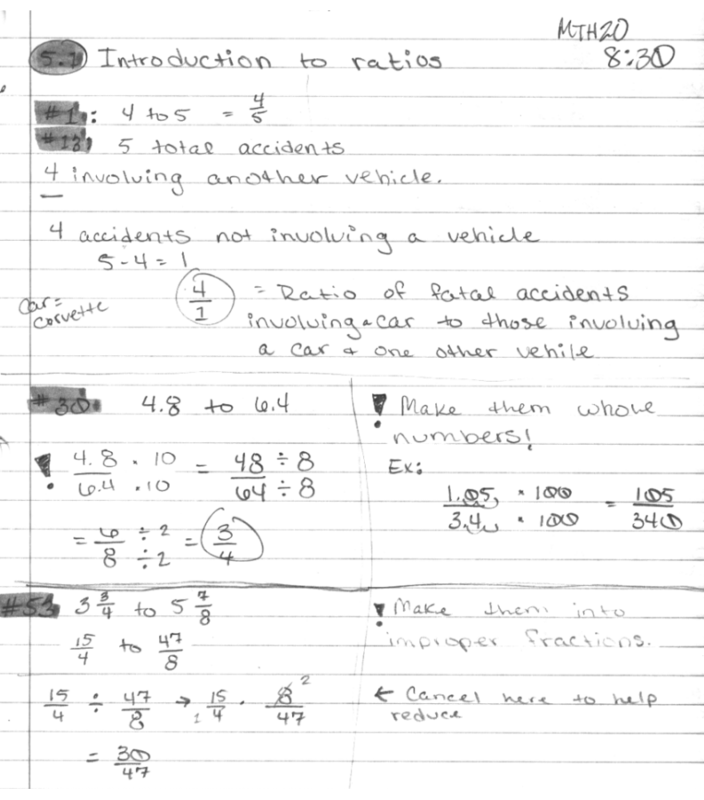 Most students in a "learning math skills" class use · instead of × to write multiplication. This is a good habit to prepare for later algebra classes. However, using · in a class that uses decimals frequently can be tricky. Make sure decimals are at the bottom of the line and multiplication dots are higher. 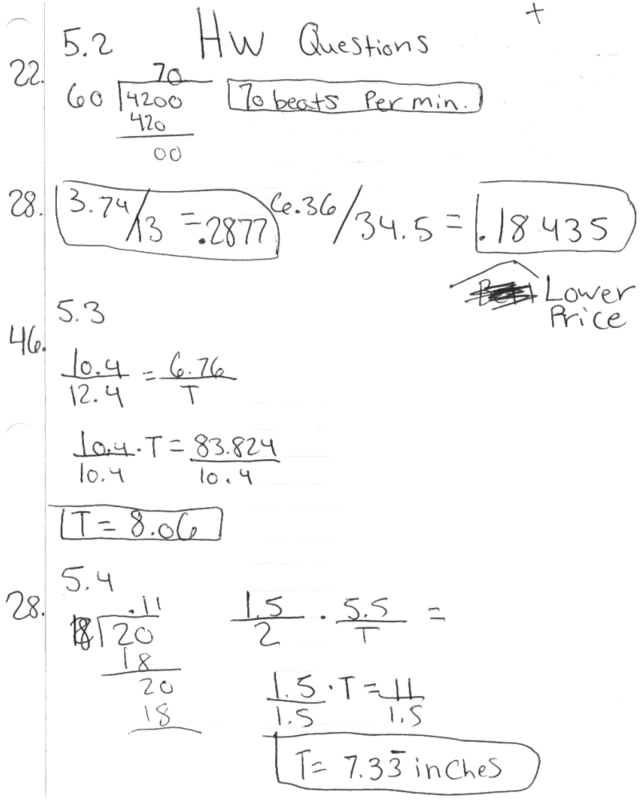 Use horizontal spacing of work to increase clarity when decimals are multiplied. In some problems it may even be necessary to take the time to draw multiplication dots larger than decimal dots. 4. Steps are clear and small enough to answer "What was I thinking here?" The purpose of step-by-step work is to create clarity about where errors happen. Hopefully you will notice the errors as you do the problem, and fix them. If not then whomever is grading your work still gets the benefit of knowing exactly where you were careless or confused. 5. Proper math grammar is used when moving from step to step, and when canceling. When solving problems you have two big tools. You can do the same thing to the top and bottom of a fraction (or ratio). You can do the same thing to both sides of an equation. There are correct and incorrect ways to write reducing or un-reducing a fraction. 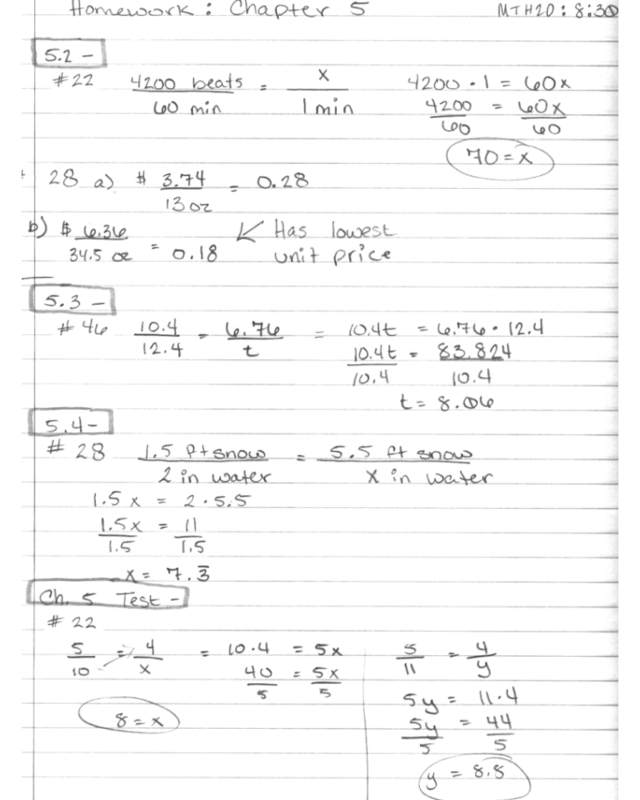 See Example 3 and Example 6 of the fractions lecture notes. It is a good habit to use distinct cross-out lines each time fraction canceling happens in the problem. If all the cross-out lines are single diagonal lines going the same direction then when reviewing the problem it is very slow to double-check how you did more than one bit of canceling. Vary how you write cross-out lines: single versus doube, diagonal right versus diagonal left, straight versus wavy. In the sample Midterm step-by-step answers, I had two bits of canceling in one step within problem #5. I wrote my cross-out lines diagonally but going opposite directions. 6. Rates that should have labels do have labels. Proportions have equal signs. These are two aspects of proper math grammar that are significant enough in Math 20 and Math 25 to deserve extra attention. Labeling rates allows double-checking that canceling or cross-multiplication is legal. 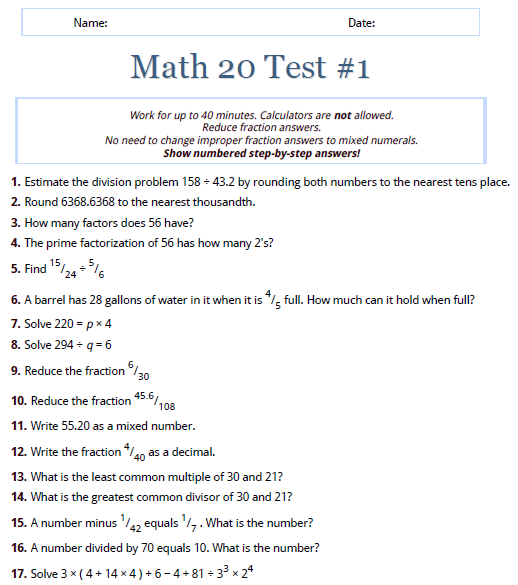 Math 20 includes many "trick questions" in which the initially provided measurement units do not match properly, and must be adjusted before a proportion can be solved. Including an equal sign in the middle of a proportion is important, especially if more math happens to either side. 7. There are enough equal signs for flow. Equal signs really mean everything they connect is equal. y = 7 + 8 + 9 = 15 + 9 = 24.
y = 7 + 8 = 15 + 9 = 24. My colleague Eric Hogle calls this the "read it over the phone test". If you pretend to read your work to someone over the phone you can more easily notice when you are trying to start a new step in the middle of an equation. 8. Problems are clearly numbered, spaced apart sufficiently, and easy to find. We do want to avoid wasting paper. But if we cannot clearly find and read each problem the entire assignment is somewhat of a waste. In the sample Midterm step-by-step answers, I could have started writing problems #2 or #14 one line higher. The work would have fit. But it would be slightly less legible and would not have saved any paper. 9. Enough of the original problem is included to allow double-checking for copying errors. For many students the most common careless error is copying the original problem incorrectly. This can happen in your head, so do not jump write to solving the problem without writing enough of the original problem. Among the math topics we study, a key example of this criterion is writing a percent sentence (or extracting which values are "part" and "whole") before changing it into an equation. In the sample Midterm step-by-step answers, I made sure to write the original, unestimated amount for problem #1. 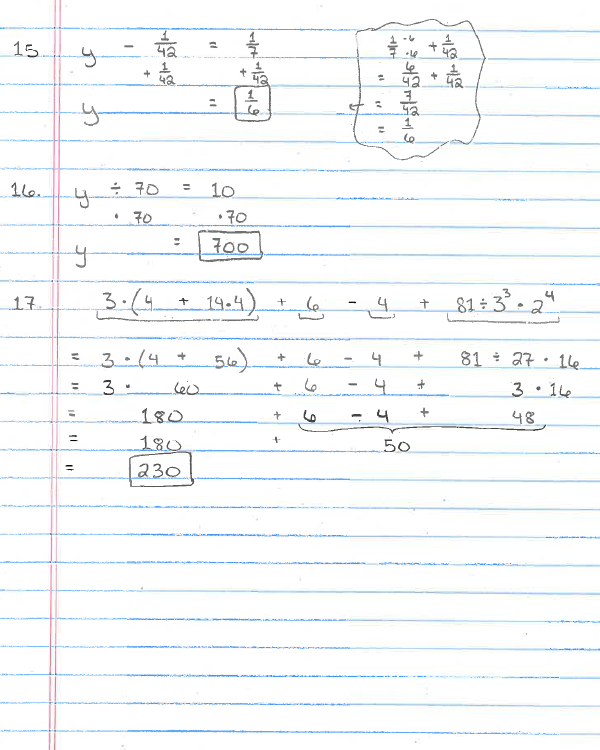 I also wrote the task for problem #2 to aid later double-checking that I rounded correctly. 10. Appropriate parts of the problem line up vertically. Equations are solved with the Vertical Format. Double-checking work (or grading it for partial credit) is much more slow and succeptible to errors if steps do not line up appropriately. In the sample Midterm step-by-step answers, I lined up my equal symbols and letters for problems #7, #8, #15, and #16. Also, problem #17 involved an expression with four terms and I kept each term in its own horizontal column while simplifying. 11. Work written horizontally to emphasize terms and to leave room for fraction reducing/unreducing. Leave more room around + and − symbols than × and ÷ symbols. This helps your eye and brain naturally prioritize multiplication and division. When adding or subtracting fractions remember to leave room before the + or − symbol and after the second fraction for those little numbers that show how you are multiplying each fraction. In the sample Midterm step-by-step answers, I put a lot of space after the fractions in problems #9 and #10 before writing an equal symbol. I know I will be reducing them, and leave room for writing how I divide the numerator and denominator. 12. "Off on a tangent" work is to one side, set apart with a brace or cloud, and points to where it fits in. Fraction arithmetic and long division are the most common "off on a tangent" work. When solving an equation, do not try to squeeze fraction arithmetic or long division into the Vertical Format of solving the equation. Do that work off to the side where it can be written large enough and neatly enough to make double-checking easy. In the sample Midterm step-by-step answers, I had "off on a tangent" work in a cloud as part of problems #7, #8, #12, and #15. In each case I drew an arrow to show where that work related to the main problem. This is polite. If you use non-standard abbreviations it makes extra mental work for the person reading your paper, whether a study partner trying to work with you or an instructor grading a test. 14. The answer is easy to find in a box (or otherwise made distinct). Whomever is grading your work for partial credit will appreciate this small politeness. In the sample Midterm step-by-step answers, I put a box around my answers. 15. Answers that should have labels are correctly labeled. Do not be forgetful or sloppy if the problem is a word problem or another type whose answer needs a label. Be professional. 16. Fraction answers are reduced. I am not sure who invented this rule for students learning math skills. We might not like it. But reducing fraction answers is required. To conclude, here are two examples of student homework with nicely written step-by-step answers. Most students find it helpful, as soon as possible after each class, to combine these sources to make their notes "completed". Add to what you wrote during class your thoughts you did not have time to write. Then augment your notes with helpful things you notice when looking at the textbook pages and the instructor's public lecture notes. Making notes "completed" is a great aid to learning the math topics. It is especially important to try this early in the term. Early practice will help you become quicker at "completing" your notes, saving you time later in the term. Not only does making notes "completed" help you review and better learn the math topics, but when it is time to study for a test all four types of information are now optimally accessible in one place. Someone who reads "completed" notes should be easily able to see how you processed the notes after class ended. Make your after-class additions distinct! Equally important for creating readable and helpful notes is the formatting. Notice how the lecture notes on this website are examples of good note taking formatting. Your in-class notes should also have these four characteristics. (Then your "completed" notes automatically will.) It makes a big difference when studying! How can we include those four characteristics when using pencil and paper? Many students like using two or three columns. Let's look at examples of each. You are not required to use columns as your method of including those four characteristics of note formatting. The following examples are only suggestions. To use two columns, simply reserve the right-hand margin for "completing" the notes you write in class. This means you need to find some way to keep narrative and examples from blurring. You also need to label when a topic changes, and make definitions stand out. Some students like using three columns. This method puts narrative in one column and examples in the second column. This helps a student realize when a topic is missing an example. The third column is for "completing" the notes. Topic changes and definitions still need to be clearly marked. To summarize, you have two tasks when creating quality notes. First, be sure to "complete" your notes by spending time with them after class, adding whatever is needed to make them a maximally useful aid for studying in that math class (and perhaps future math classes too). Second, in class write nicely formatted notes using any system that includes those four formatting characteristics. Here are three great examples of student notes. As before, click on the small version to go to the full size version. For most students, using a calculator too much hinders developing a conceptual understanding of math topics. The concepts of ratio, proportion, percent, and unit conversion are so closely linked to foundational concepts about fractions and decimals that treating the numbers that appear in problems as values instead of as structures is detrimental. 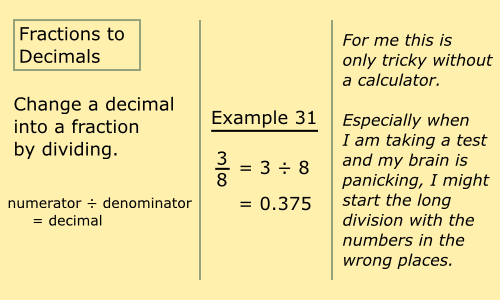 This is especially true early in the term, to help firm up any weaknesses in how students understand fractions and decimals. Therefore calculators are prohibited during the first two weeks of Math 20, and should be used as little as possible afterward. However, calculators are not evil and the inclusion of "messy" problems that expect calculator use is quite appropriate to a math class preparing students for real life. Learning to use a calculator effectively is part of the Math 20 curriculum. A calculator is required for Math 20. But remember to avoid letting the calculator tempt you to approach a new math topic as a collection of procedures rather than a unified concept dealing with structure and meaning. Enjoy using learning how to use your calculator when it is the right tool for the job, while at the same time please realize that learning how to not use the calculator unless necessary will be equally important. The textbook, unfortunately, does not begin its presentation of each topic with enough homework problems involving simple numbers whose arithmetic works out nicely. It forces students to jump too quickly into problems for which using a calculator is a very reasonable decision. What can we do if a problem involves numbers too big to fit into the calculator? There is a trick! As one example, see the ratio warm-up problems. One problem considers the national debt and population to ask what is the national debt per person. Most calculators cannot handle a fourteen-digit number. That problem's commentary shares what to do. There are four calculator keys that many Math 20 students have never used before. Three are important! One is only a potential distraction. The previous answer key is very useful. Please take a moment to make sure you know how to use the version on your calculator. Your instructor will provide an example problem. The exponent key will not be needed for Math 20, but is used often in Math 25. Please take a moment to make sure you know how to use the version on your calculator. Try 23 = 8. Notice that on some calculators this key looks like yx and on others it looks like ^. But the display shows ^ for both kinds of calculators! (There is also a calculator key labeled EXP. This is for Scientific Notation. Do not confuse it with exponents! The pi key will be needed when we talk about circles in Chapter 9. Unlike the other keys, it does not hook two numbers together. Instead, it stands for one number. The percent key is never used. Ignore it! The percent key works differently in each case! 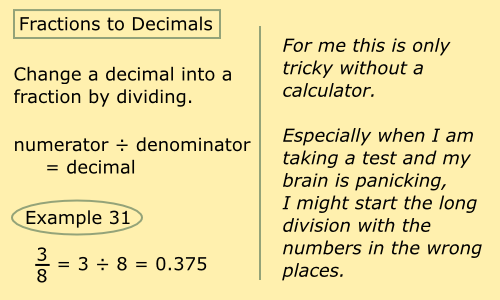 It is much simpler and safer to always use decimals with the calculator. After all, it is so easy to change between percent format and decimal format by scotting the decimal point twice with RIP LOP. The square root key is wonderful. We do not need to learn the tediously lengthy ways that people once used to estimate square roots to a decent number of decimal places. On some calculators this key automatically does "equals" and shows the answer. On other calculators you still need to press "equals" or "enter" to see the answer. These online lectures discuss topics a bit differently from the textbook. This is purposeful, so that if one way of thinking does not work well for you perhaps the other explanation will work better. Let's look at §5.1 to see how our textbook works. To begin with, turn to the beginning of section §5.1. Notice how different it is from a lecture! This is obvious but worth carefully considering. First notice that this section has two objectives, marked with red boxes. These are listed at the top corner of the section's first page. So this book is very polite! When you are doing homework it shows you which problems correspond to which pages of explanation and example problems. The part a problems always come first, then the part b problems. When it is so easy to find a helpful example problem, there is a temptation to learn mimicry but not conceptual understanding. Avoid this temptation! If the textbook was not so polite, how would using the textbook change for you as a student? During class you can always ask the instructor which example problems correspond to homework problems giving you trouble. When studying in a group, a good "hint" for a friend is which example problem matches a homework problem. The textbook has definitions and example problems, like in a lecture. Definitions are in purple boxes. Example problems are in the main text. The textbook provides more example problems than a lecture. What does this mean to you as a student? 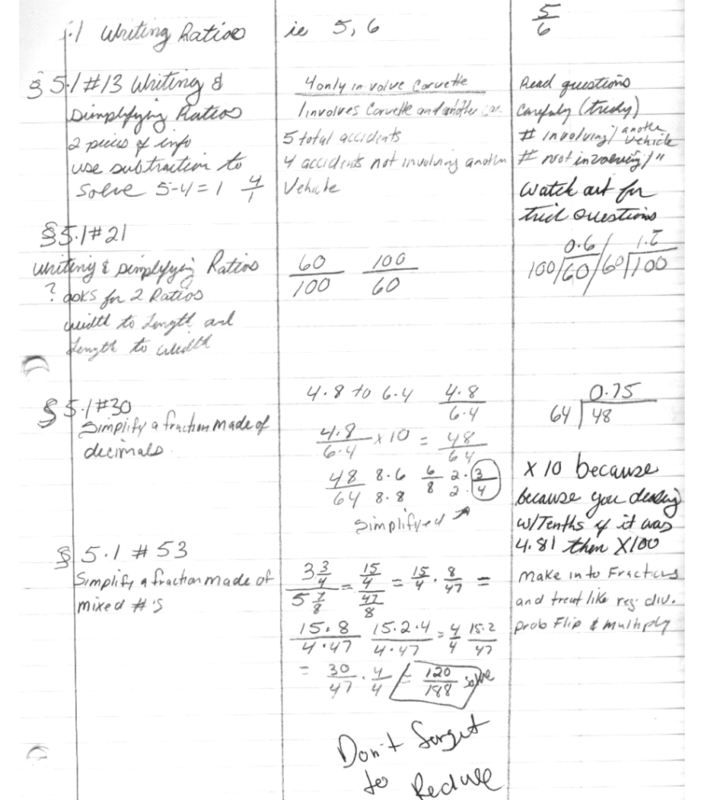 Note that below the example problems are notes that point to exercises to do as you read (for example, see page 296). 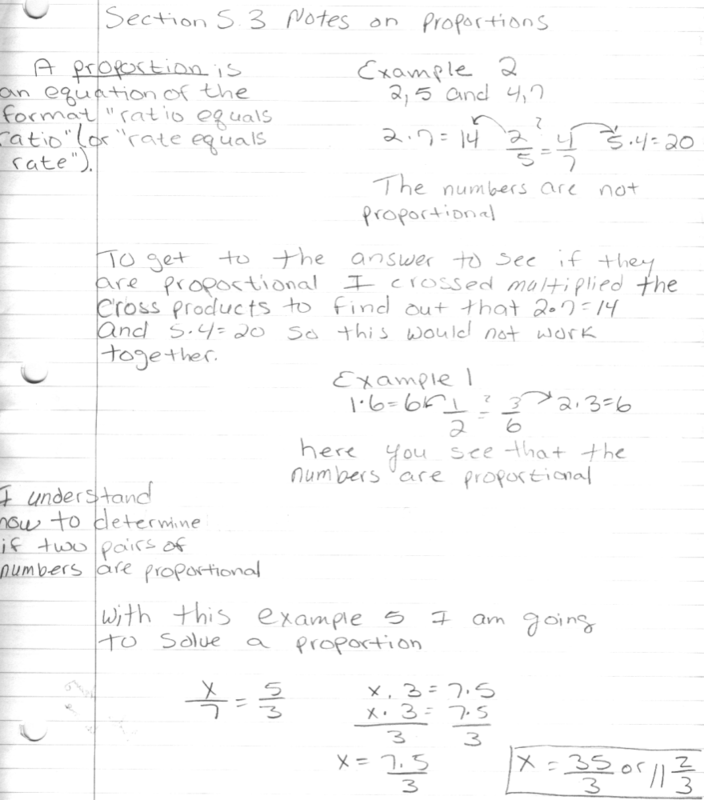 Note that below the example problems are notes that point to exercises to do as you read. Notice that these exercises are not the homework, but conveniently in the margins! The exercises in the margins let you check on your understanding as you read. If your textbook did not provide these margin problems, what could you do as a replacement to check your understanding as you read? Most students read the chapter once. They skip ahead to the homework problems and do a few as they read the chapter to check their understanding. Some students read the chapter twice. The second time they cover steps of the example problems with a piece of paper, and try to do the example problems themselves. Turning to page 299, there is a box of study tips. These are not specific to studying math, so they I will not discuss them now. Are these reminders in your textbook helpful? Turn to the §5.1 homework. There are problem groups named Skill Maintenance and Synthesis on page 302. Of what use are the Skill Maintenance and Synthesis problems? How could their purposes be accomplished if your textbook did not provide these kinds of problems? The Skill Maintenance problems are review. Do not let yourself get rusty on old topics! That will make the final exam needlessly difficult. Do a few problems from old chapters each week. The Synthesis problems lack an example problem to mimic. They require you to use ideas from different concepts together. This is another reason to do homework in groups! In a group solving these problems can be much more enjoyable. To conclude looking at Chapter 5, turn to the end of the chapter as an example of the extra study help at the end of each chapter. A Summary and Review for the chapter is on pages 338-342. A Chapter Test is on pages 343-344. A Cumulative Review is on pages 345-346. For all three of these both odd and even answers are in the back of the book. Finally, proper textbook use includes using the table of contents and index. What if you wanted to review Powers of Ten in the textbook? Where would you look? You could check the table of contents. Chapter 4 is about decimal notation. §4.1 is about decimal notation, order, and rounding. This probably relates to Powers of Ten. You could also check the index in the back of the book. The index directs us to page 236 and pages 245-246.